The Barrow Area Support Team works with residents and community groups based in Barrow. We deliver community engagement activities that help you speak up about the issues that matter to you. Our community engagement work can include a variety of activities from consulting the community about something the council is thinking about doing, to gaining information or support for a local community project or council initiative, or seeking public opinion over the design and delivery of local services. 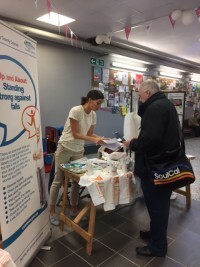 We regularly hold community engagement activities and events across the district to respond to community issues or concerns and to enable communities to influence local decision making. We work alongside the eleven County Councillors in Barrow which make up the Barrow Local Committee, the council's local decision making body which serves to improve local services and the quality of life for the residents of Barrow. We also manage a range of grant funds that are available to support community groups to develop and deliver locally based community projects and initiatives. For further information visit our grants and funding page.